Shop with peace of mind and get the best gift for your loved one this holiday season. Sonic Electronix has an extended return policy so you can be confident with your purchase. On top of that, we've worked closely with our shipping carriers to make sure your package arrives for the big day. We know how hard it is shopping for others, especially when purchasing electronics; however, we're here to take that pain away! Our standard 60-day return policy is one of the best in the industry. In the event that your gift is defective or broken, we'll gladly exchange it for the same item or issue store credit if we're sold out. It's just another way for us to show our commitment to you! Make sure that your packages arrive on time for the holidays by following the shipping chart below. If you place your order by the date listed and select the appropriate shipping method, you can rest assured that the package will arrive by December 24th, 2018. 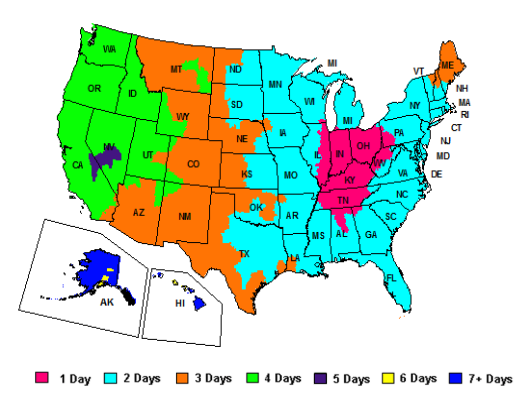 To view shipping times to your state Click Here. For full details about our shipping, visit our Shipping Policy.